HSD’s Interim Director Jason Johnson began by explaining the importance of being accountable for how taxpayers’ money is spent as a substantial funder of human service providers in the city. “What we are going to move through are some early results from providers. This is their data, and this is data that they are sharing with us both in the homeless management information system as well as through our contracts, invoices and engagement that we have directly with them. Our funding is really just one element of funding that providers depend on to do this work. So often there is a lot of attention on the city dollars, on those public dollars, that come from this municipality, but I just want to acknowledge that providers are dependent on King County funding, on dollars that come through philanthropy, other public funders, as well as doing a lot of private development, that they do to get donations. So I always want to acknowledge when I’m talking about the results of the organizations that we invest in, I don’t want to pretend that we’re the only revenue source that they depend on. Johnson, along with his colleagues Tiffany Washington and Dusty Olson, then launched into a presentation full of data and charts explaining where the money is going and what results they are getting from each of the programs in the department’s portfolio. 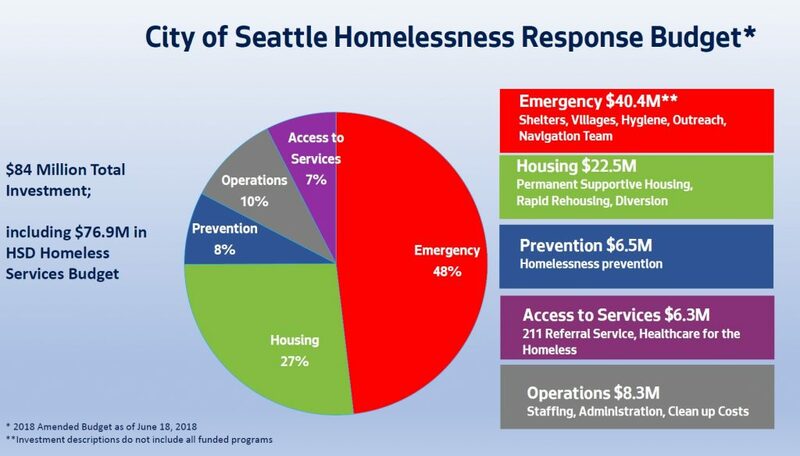 They began with a two-slide overview, showing the spectrum of services that HSD provides as part of its homeless response and the corresponding budget. When possible, HSD attempts to prevent people from becoming homeless in the first place. As part of the homeless response, HSD has prevention programs intended to intervene at the last moment, e.g. when they receive an eviction notice (HSD has other programs to intervene earlier as part of their Youth and Young Adult program and their Aging and Disability Services program). 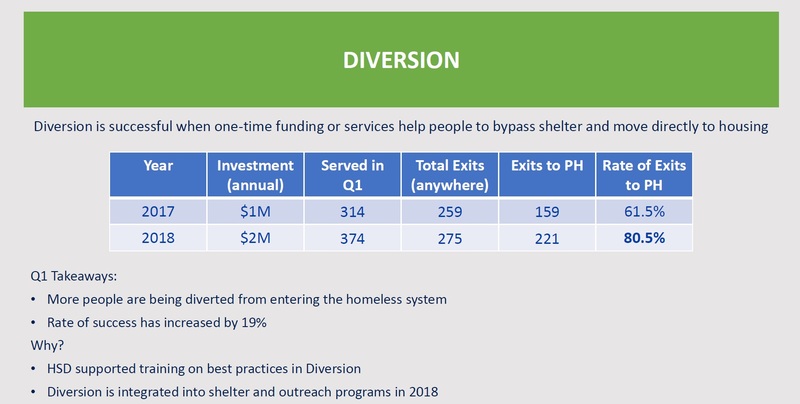 If it’s too late for prevention, the department tries to divert people from entering the emergency homeless system into a diversion program, a rapid rehousing program, or into permanent supportive housing. And for those who do enter the emergency response system, HSD provides a range of shelter options. The conventional thinking has been that the system needs to be “person-centered,” in that having a wide variety of options allows resources and programs to be offered that are best tailored to the specific needs of a homeless person or household. But HSD is quickly learning that certain kinds of programs tend to work better for specific demographics and has been tailoring outreach and the programs themselves with an expectation that they can target programs to the people they are most likely to help. Johnson and his staff walked through each of the major programs, presenting statistics on how each did in the first three months of 2018 as compared to last year. The prevention programs are remarkably successful at keeping people in housing. The numbers look like they dropped a bit from last year, but as Johnson and Washington explained, three new programs ramped up in the first quarter but aren’t allowed to count a success until 90 days after a client exits the program; their numbers skew the Q1 results but will be more accurately reflected in Q2. The diversion program, which helps with immediate needs such as security deposits and first/last month rent, saw a big jump in its success rate compared to a year ago — from 61.5% to 80.5%. The program also increased the overall number of people served. HSD claims this was done through improved training and by integrating the program into outreach and shelter programs. 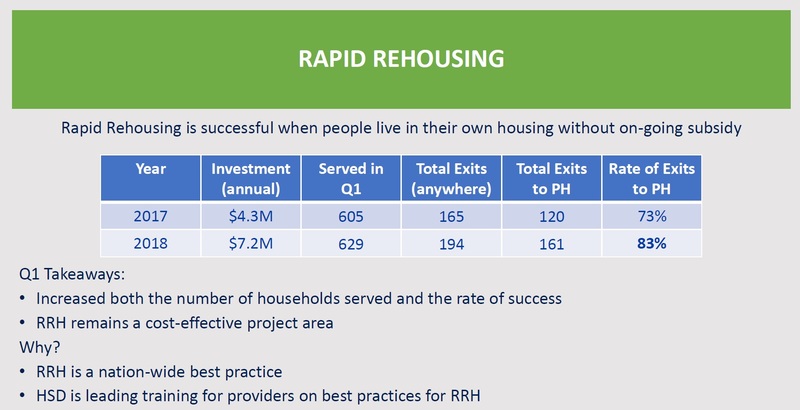 Rapid rehousing, a program that subsidizes rent for a limited number of months to get someone re-established in stable housing, also served slightly more people and saw an improvement in results, again, through improved training for providers. RRH has been somewhat controversial; it’s generally thought of as a nationwide best practice and more cost-effective than some other alternatives, but after the release of the Poppe Report and the “Pathways Home” plan, there was concern that money was being shifted away from transitional housing programs and that RRH’s success rate was overstated because of over-focus on the short-term (i.e. shortly after the subsidies stop, people lose the housing and re-enter the homeless system). But HSD claims, based on data collected by All Home of King County, that six months after the subsidies end only 5% return to homelessness. They also said that they collect data on outcomes 12 and 24 months after subsidies stop, and they found the results to be consistent across the three data points. 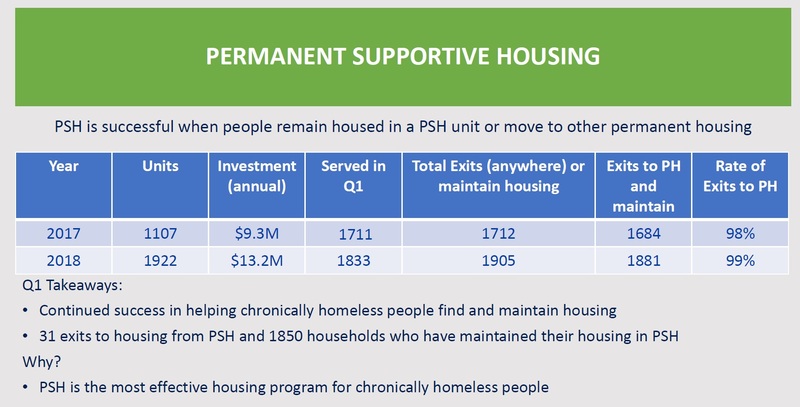 HSD’s permanent supportive housing program, which provides ongoing support for people who are unable to sustain living independently, is their most expensive program, but HSD has found that it is the most effective program for housing the chronically homeless. It’s a different kind of program because, true to its name, it is expected to be permanent rather than a stepping stone; of 1833 people served by the program in Q1, only 31 exited to other forms of permanent housing. The measure for success is whether people who enter the PSH program can stay in it, and the good news is that 99% do. Transitional housing is a different story. HSD has changed it from a program aimed at a broad set of clients to one mainly targeted at youth and young adults, because national data has shown that it is much more effective for them. It’s an expensive program because it provides more “wrap-around” services on top of the housing, but by focusing it on youth and young adults HSD has driven the success rate up. The city is relabeling its sanctioned encampments as “villages,” a nod to the rapid spread of tiny homes — fewer residents are actually living in tents. HSD has learned that when a village offers enhanced services, it has more success in exiting people to permanent housing. Unfortunately, today only one village, Aurora-Licton Springs, offers enhanced services. Finally, there are the basic and enhanced shelters. The city has put significant effort and resources into transitioning from basic shelter beds to enhanced, 24-hour, low-barrier shelters. The reasons are clear: unsheltered people are much more likely to accept an offer of a bed in an enhanced shelter, and enhanced shelters are six times more likely to exit someone into permanent housing. That said, the success rate even for enhanced shelter is still very low — just slightly better than the sanctioned “villages.” Just last week, the City Council approved funding for Mayor Durkan’s plan to add 500 additional shelter beds over the next 90 days, the majority of which are enhanced shelter. Clearly HSD is learning what works and what doesn’t, and is getting better at making data-driven decisions that are improving their success rate. That said, HSD also notes what the “point in time” count results document: the need continues to grow faster than the available resources have been moving people out of the homeless system. Nevertheless, it’s good to see HSD focused on improving the results of the existing programs. And it’s a refreshing new look for HSD to be so transparent about its activities and results. Can we quantify the demographics of who is entering and leaving the homeless system on a quarterly basis? That would tell us much about the kinds of services that still need to be added. It would also address a separate concern: as HSD gets better at targeting programs to specific demographics, are there groups that are getting left behind? Comparing the people entering with the people exiting would point out if some are getting stuck in the middle. We know from the “point in time” count that the number of homeless veterans has dropped dramatically. What was the intervention that drove that drop? 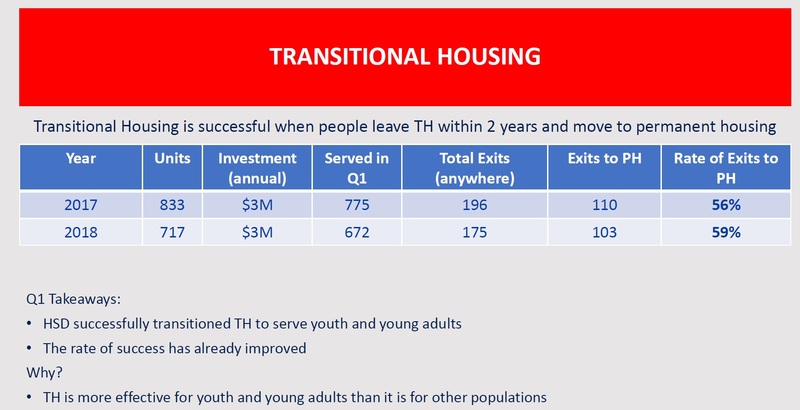 Now we know that transitional housing is most effective for youth and young adults, we should be asking a similar question for other programs. 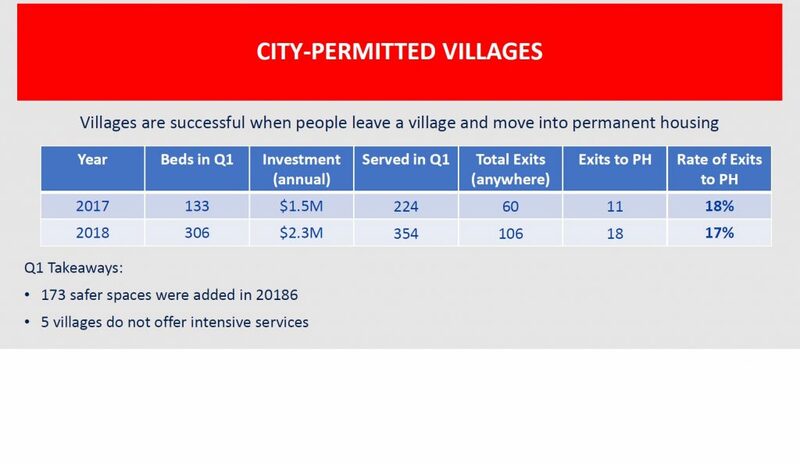 For example, who are most likely to successfully exit to permanent housing from the sanctioned villages, and who are likely to languish there? It would be nice to see HSD’s data on outcomes 6, 12 and 24 months after exit. It would also be good to see numbers for the programs that King County runs on the city’s behalf, including substance abuse and mental health treatment programs. Is there any evidence that providers are “creaming” their clients, i.e. only choosing clients to work with who are more likely to successfully exit to permanent housing? That is an ongoing concern as HSD has moved to performance-based contracting with providers. And finally: it would be great if the City Auditor verified the performance numbers. HSD has a deficit of credibility at the moment as regards to its homelessness programs, and there will be people who refuse to believe anything they say. A credible audit might just sway some of them. What HSD presented today was a huge improvement in transparency and accountability from how things looked under the leadership of former HSD Director Catherine Lester, who left earlier this year. In fairness, the performance improvements in the programs themselves don’t happen overnight and Lester deserves credit for pushing her organization to make the necessary changes. However Johnson — and Mayor Durkan — deserve the credit for dropping the shields and showing us what is really happening. It wasn’t all good news, but at least it isn’t hidden anymore. And we know that they have identified some of what works (and doesn’t) and are making thoughtful, informed decisions. You can watch today’s HSD briefing here (jump to 1:27:00). Thanks for covering this in detail!